Despite launching to, er, an amount of fanfare, VR is still by and large uncharted territory. I see a bunch of ideas slowly sliding down a wall. Will any of them stick? Beats me. Even game prices have no real standard, which brings us to Job Simulator’s recent price cut. Job Simulator is one of the HTC Vive’s marquee launch games. This is, in part, due to the fact that it’s an actual game—or at least, the seams holding its minigames together aren’t as egregiously visible as some. It’s been out for two weeks, but its developers have already lowered its price by $10, from $40 to $30. This isn’t a blink-and-you’ll-miss-it Steam deal, either. 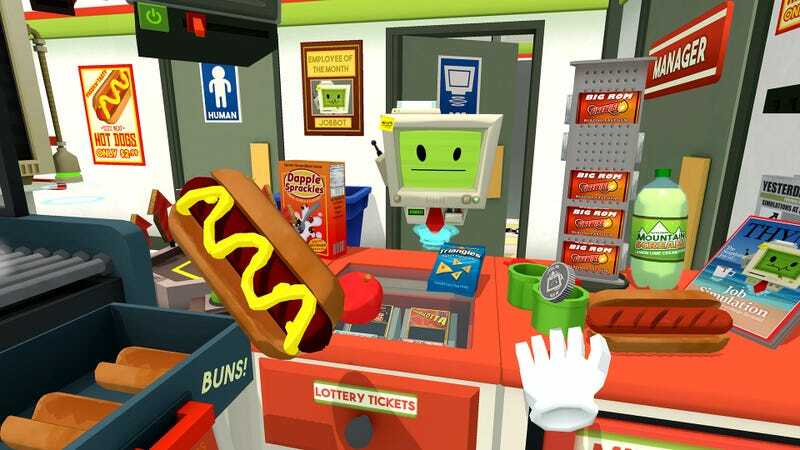 Job Simulator’s new asking price is here to stay. By typical major game standards, $40 isn’t the end of the world, virtual or otherwise. However, a handful of Steam reviews and forum posts have harped on the game’s price, accusing the game of being too insubstantial to warrant it. It’s a bit odd, given that Job Simulator, a Vive exclusive, has been part of a bundle deal since launch. Essentially, it’s free if you buy a Vive. That deal won’t last forever, though, so Owlchemy decided to take preemptive action. They added that you can refund the game and re-buy it at the new, cheaper price, even if you’ve played for more than two hours. A nice way of handling a tectonic pricing shift, that’s for sure. What’s surprising here is that Job Simulator is currently a game that comes with the Vive for free. Despite this, SteamSpy estimates that it’s only moved somewhere in the neighborhood of 7k-9.5k units. Lowering the price might help in the long run, but right now it’s technically a free game to any and all people who can actually play it. The issue at the moment, then, is VR itself. It’s still far too early to start counting chickens, though, especially with all the shipping issues these things have faced, not to mention how expensive high-end VR is in the first place. It’ll be interesting to see what happens as fans and developers alike decide what constitutes a $30 VR experience versus a $40 VR experience (as opposed to a regular game at those or any other prices). I’m also curious to see how many developers will continue to create games for VR hardware as it becomes increasingly apparent that they’ll probably be taking a sizable loss for a while. VR’s not the gold rush some hoped it to be; it’s a grease-stained Vegas gamble (with a healthy chunk of venture capital change in the pot). I’m sure that’s why some studios opted to launch on Rift and Vive with smaller games; they didn’t want to pour the full brunt of their time and resources into an uncertain niche. Higher game prices are one way to compensate, but as we’ve seen with Job Simulator, fans might not be so supportive of that decision.